Born in New York in 1916, Eyvind Earle began his prolific career at the age of ten when his father, Ferdinand Earle, gave him a challenging choice: read 50 pages of a book or paint a picture every day. Earle chose both. From the time of his first one-man showing in France when he was 14, Earles fame had grown steadily. At the age of 21, Earle bicycled across country from Hollywood to New York, paying his way by painting 42 watercolors. In 1937, he opened at the Charles Morgan Galleries, his first of many one-man shows in New York. Two years later at his third consecutive showing at the gallery, the response to his work was so positive that the exhibition sold out and the Metropolitan Museum of Art purchased one of Eyvind Earle's paintings for their permanent collection. His earliest work was strictly realistic, but after having studied the work of a variety of masters such as Van Gogh, Cezanne, Rockwell, Kent and Georgia OKeefe, Earle by the age of 21, came into his own unique style. In 1951 Earle joined Walt Disney studios as an assistant background painter. Eyvind Earle intrigued Disney in 1953 when he created the look of Toot, Whistle, Plunk and Boom an animated short that won an Academy Award and a Cannes Film Festival Award. Disney kept the artist busy for the rest of decade, painting the settings for such stories as Peter Pan, For Whom the Bulls Toil, Working for Peanuts, Pigs is Pigs, Paul Bunyan and Lady and the Tramp. Earle was responsible for the styling, background and colors for the highly acclaimed movie Sleeping Beauty and gave the movie its magical, medieval look. He also painted the dioramas for Sleeping Beautys Castle at Disneyland in Anaheim, California. Eyvind Earle also designed popular greeting cards that utilized more than 500 of his paintings. 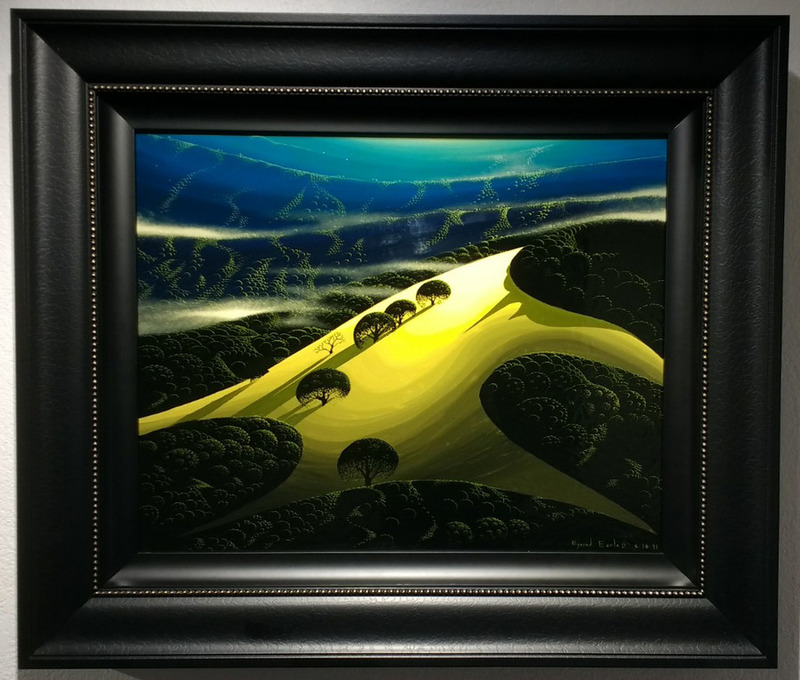 In 1961, Eyvind Earle established his own animation company, and continuously painted landscapes in oil and acrylic, using acrylic before 1971 and oil after that. His most famous paintings are of California mountains and valleys. Eyvind Earle successfully synthesizes seemingly incongruent aspects into a singularly distinctive style: a style, which is at once mysterious, primitive, disciplined, moody and nostalgic. He captures the grandeur of simplicity of the American countryside, and represents these glimpses of the American scene with a direct lyric ardor. Eyvind Earle's landscapes are remarkable for their suggestion of distances, landmasses and weather moods. For 70 years, Earle wrote in 1996, Ive painted paintings, and Im constantly and everlastingly overwhelmed at the stupendous infinity of Nature. Wherever I turn and look, there I see creation. Art is creating...Art is the search for truth. Remember every time you purchase Eyvind Earle artwork over $995, shipping is FREE in the continental U.S. and there is NO SALES TAX when you purchase outside of Colorado. 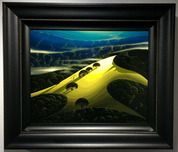 We SHIP WORLDWIDE and offer Layaway for Eyvind Earle art.